Recent high resolution spatially resolved observations of protoplanetary discs are showing that dust rings and gaps are common in protoplanetary discs. One way in which dust rings could form is if planets are embedded in the discs. These planets are expected to migrate in the protoplanetary disc. 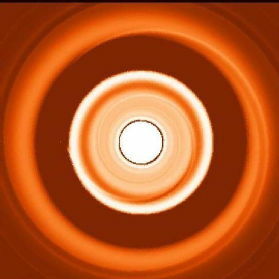 We showed using numerical simulations of gas and dust what an observational signature of a migrating planet is: if small dust forms a ring interior to a gap and large dust forms a ring exterior to the gap, this will be a strong indication that there is a migrating planet in the disc. We have known about the theory of planet migration in dics for 40 years but for the first time we now have a observational test for it. This work was also described in a press release. Elias 2-27 -- a self-gravitating disc or a companion at large radii? Following the first observation of large-scale spiral structures in Elias 2-27 in unprecedented detail with the powerful interferometer, Atacama Large Millimeter/submillimeter Array (Perez et al 2016), we used our computer simulations to investigate the origin of the spirals. In a first paper we found that the large-scale spirals are consistent with either the disc being unstable or a companion beyond 300au. You can read articles about it here and here. In a follow-up paper we examine the spiral morphology in the simulations and find that the asymmetry between the spiral arms is a key observable, and therefore it is important that the spirals are fit individually. We predict that if high resolution ALMA observations of Elias 2-27 continue to show tightly wound, symmetric spiral structure, then Elias 2-27 would be the first observed self-gravitating protostellar disc. In realistically modelled young discs, a fragment in the outer disc can trigger another fragment to form in the inner disc. This “Triggered Fragmentation” mechanism may, for the first time, provide a formation mechanism in a region where planet formation by Gravitational Instability is unexpected. Read the paper here. We performed the first systematic study of planets interacting with young discs, showing that planets move surprisingly fast and that planet survival is hard in such discs. In a follow-up paper we showed the relative importance of the timescale for gap-opening and the migration timescale: if a planet migrates too fast compared to the gap-opening timescale, it will not be able to open up a gap and will end up plunging into the central star. We showed that an additional criterion taking into account the planet migration timescale is crucial for its survival, especially when the planets are migrating very fast. I performed a thorough investigation into the fragmentation cooling criterion for young discs, initially showing that this was easier than previously thought. The main numerical issue, namely that convergence had not been achieved in past simulations of self-gravitating discs, was identified in my 2011 paper. This has been investigated further in a number of papers by others and myself (here, here and here). In an earlier paper I also explored the fragmentation of irradiated discs with varying opacity. Using computer simulations we modelled the growth and fragmentation of dust grains as they collide in a protoplanetary disc, ultimately to understand the conditions under which planets form. In a first paper we explored the effect that porosity and aggregate size has on its growth. We also developed a dust coagulation and fragmentation model that considers dust collision velocities in more detail than before. This paper showed that the first steps of planet growth occurs to orders of magnitude larger than previously achieved, thus finding a potential way to overcome one of the long-standing barriers to planet formation by Core Accretion. We have also updated this model in a recent study.